Denver, CO – When traveling through downtown Denver, it is impossible to go a few blocks without seeing construction projects for new apartment buildings. Some may see these new developments as necessary improvements for an up-and-coming booming hipster city, however the ones who are being involuntarily displaced feel differently. Prior to the summit, members of Denver Homeless Out Loud, People Rising Against Poverty, and other local organizations advocating for basic human rights for people experiencing poverty and homelessness, filled out scholarship applications with the hopes of sharing their personal experiences with the rising housing costs and the rapid gentrification occurring in Denver. Evidently the summit did not want to hear from the people who are truly affected—they only offered five scholarships and the tickets cost $50 each. Out of the eight members who applied for scholarships, only four received them, so the others had to pay the expensive fee. According to “The Self-Sufficiency Standard For Colorado 2015” report by Colorado Center on Law and Policy, the cost of living across the state has outpaced wages by a ratio of 3:1 over the last fourteen years. Much of this increase is from a lack of truly affordable housing where the average rental unit in Denver rests at a prohibitively high average of $1,291 per month, following double-digit percentage growth year after year. To afford this average rental price in the Denver metro area, renters need to make $35 an hour, or almost four and a half times Colorado’s minimum wage. Thus increasing and fueling the cycle of poverty and homelessness for many Denver residents. “Security immediately stopped them and asked them what they were doing there. They explained they had tickets waiting for them inside. The director of the Office of Economic Development, who was the principle organizer for the event, got involved and informed them that they did not want any disruptions at this event because it was supposed to be a productive event,” Terese explains. “I believe it is necessary, and unfortunate, to have to call attention to my physical appearance: I am a dark-skinned Black male, 6ft tall and over 200lbs. Moreover, on the morning in question, I was intentional about ignoring the event’s ‘suggested’ business casual dress requirement. I was also armed with two cardboard boxes ominously labeled Office Depot. And so it was that upon my approach to the entrance at Sturm Hall, I was immediately set upon by Julianne L. Stern of the Denver Office of Economic Development’s Housing and Neighborhoods Division. Without much ceremony, but with a ‘smile,’ she informed me that that the DU campus was a private institution and that the day’s event was therefore a private affair. After I made reference to my pre-arranged registration credentials, I was interrogated in regard to the nature of my employer’s business. All the while folks dressed according to code, most of whom looked nothing like me, sailed freely in and out of the front doors at Sturm Hall. I was informed that – if allowed to attend – I would not be allowed to distribute whatever I had in those cardboard boxes. Weary, angry and still under duress, I walked past the redoubtable Ms. Stern and inside the rarified air of Sturm Hall to register. While I searched for my nametag, set upon from behind by Ron Padilla, the Director of the Denver Office of Economic Development. Somehow I was singled-out for his attention, though the lobby in general – and the registration tables in particular – were densely packed with attendees. Without much ceremony, but with a ‘smile,’ I was informed that no ‘disruption’ would be permitted during the event ‘because we’re trying to get something accomplished here.’ Again I was informed that I would not be allowed to distribute whatever was in those cardboard boxes. Name tag in place, I noticed several colleagues gathering outside the entrance to Sturm Hall, so I went to join them, cardboard boxes in hand, to report what my experience had been so far. We had just enough time to greet and exchange pleasantries before I found myself flanked by two uniformed law enforcement- types. The spokesman for the pair appeared to be a Denver Police Sergeant. The other: DU campus security. We were informed with a ‘smile’ that the University of Denver is a private institution officially exercising its right to deny us permission to distribute whatever was in those cardboard boxes to any attendees of the Summit nor to any students of the University of Denver. In Colorado, affordable housing is typically defined as paying no more than 30% of gross income for housing including utilities. In 2010, 47% of all renter households were paying more than 30% of their income toward housing, and of these rent-burdened households, 51% had family incomes of less than $20,000 per year, according to the U.S. Department of Housing and Urban Development. Castro and Hancock are two major players in the intensifying gentrification and push-out of communities who are no longer able to afford to live in their neighborhoods due to the new “affordable” housing projects. When Castro mentions that cities, including Denver, “try to revitalize neighborhoods,” what he actually means is as they try to replace neighborhoods. Denver prefers and systemically manipulates into existence the immense waves of new people crashing the city who are willing to dish out nearly a grand a month for rent. By encouraging and permitting all of the massive developments of “affordable” housing, which are actually meant to house the economically well-off, the city is expressing its disdain for people experiencing homelessness and poverty. Denver would rather sweep and push away the people who are in need of truly affordable housing to make way for the people with money to spare to fill the city’s pockets. Mayor Hancock, his entire administration, the Office of Economic Development, and the U.S. Department of Housing and Urban Development are guilty of instituting and approving projects and policies which directly cause involuntary displacement, which proves that while the mayor apparently strives for a “city where everyone matters,” if you are someone with no to little money, he in fact does not value you and has in reality ordered the sweeping of you from public space. Westword recently published an article providing strong evidence of the increased sweeps of such people the city deems undesirable. “Since the sweeps began along Park Avenue West on March 8, homeless individuals have described being chased around the city by police officers, who cite Denver’s urban camping-ban ordinance when prohibiting them from sleeping under cover anywhere in public spaces — including places like the South Platte River. Now open-records data obtained by Westword through the Denver Police Department backs up their claims.The numbers released by the department show that enforcement of the urban-camping ban in March and April of this year was up nearly 500 percent compared to enforcement over the previous 45 months. According to the 2015 Point-In-Time-Report by Metro Denver Homeless Initiative, which has been known to be a low estimate, there were nearly 4,000 people experiencing homelessness in the Denver metro area, nearly 600 being veterans. 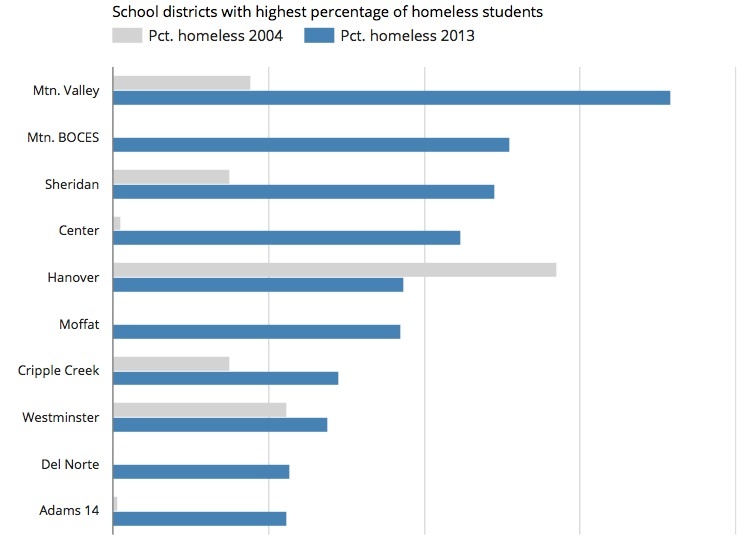 In 2014, The Denver Post investigated homeless students and found that there were over 23,000 homeless children enrolled in Colorado schools. These numbers of people experiencing homelessness will exponentially rise as long as the priorities of the people in power remain the same—making room for the newcomers who can afford the “revitalized” neighborhoods. 1) We want the most impacted populations at the policy table: Low-income, people of color, currently, formerly or on the verge of homelessness, veterans, people with disabilities and criminal backgrounds, seniors, families, youth, LGBTQIA, immigrants and refugees. 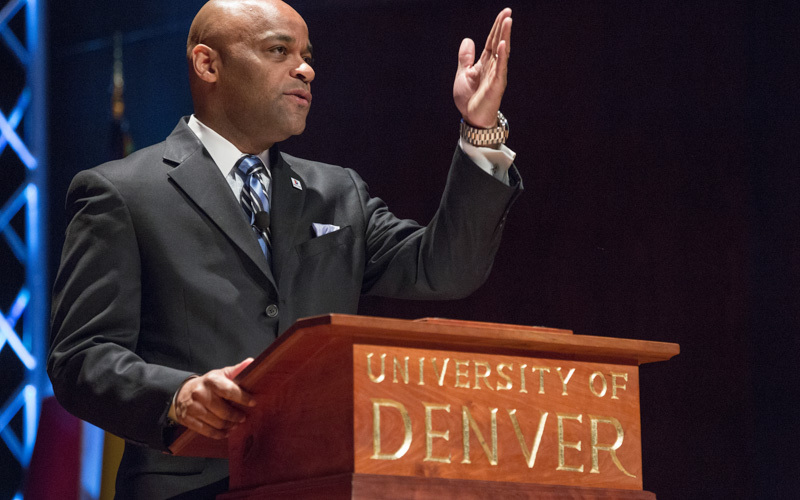 2) Development Without Displacement: We, as residents of Denver, have a choice when it comes to economic development. We can choose economic development that prioritizes community integrity, access to truly affordable housing, affordable transit, particularly for low-income passengers, and free child care. Or, we can choose economic development that prioritizes luxury condos, gentrification, and the displacement and exclusion of thousands of people from the city core. Between “blight” and gentrification, there is a middle path of development. 3) Homes For All People. Housing is a human right.